EchoTaps Delay VST/AU/AAX-DSP – History of Delay. EchoTaps is a Delay with a load of features. Available as AAX-Native-DSP for Avid Pro Tools, HDX systems and Venue consoles, VST/AU 32/64 bit for all compatible hosts on Windows and Mac systems. Vintage digital (raw and warm). Modulation and pitch shifting, rhythms and swing, diffusion, early reflections, delay routing. Multi-mode ducking (with input or ducked-by). 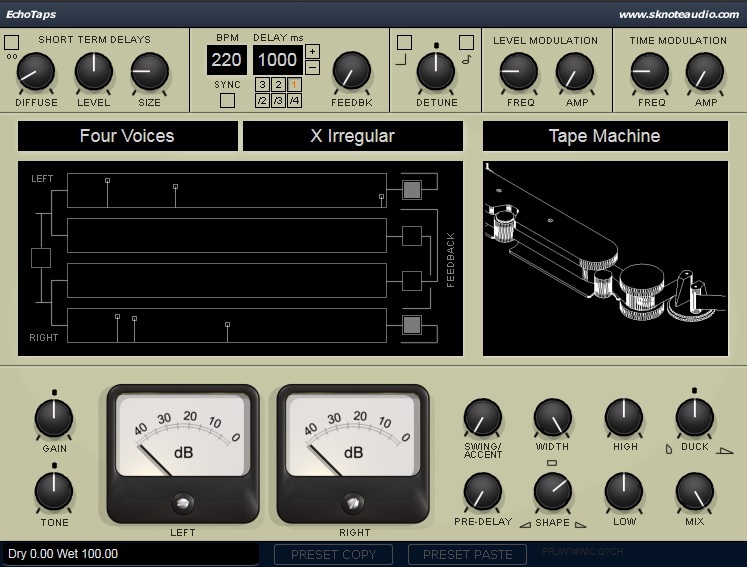 EchoTaps is available Now as AAX/Native/DSP, VST, AU for Windows and Mac 32/64 bit platforms. Available as AAX-native, AAX-DSP, VST, AU for 32 and 64 bit systems, on OSx and Windows platforms. Updates: Jun 06 2018: Win/Mac/VST/AU updated (bugfixes) – May 30 2018: all formats available. AAX-DSP, VST, AU 32 and 64bit for Windows and Mac systems.